As part of the exhibition BEING , Storefront presented DISRUPT: Croquembouches, an installation-banquet on the connections and connotations between Food and Architecture. 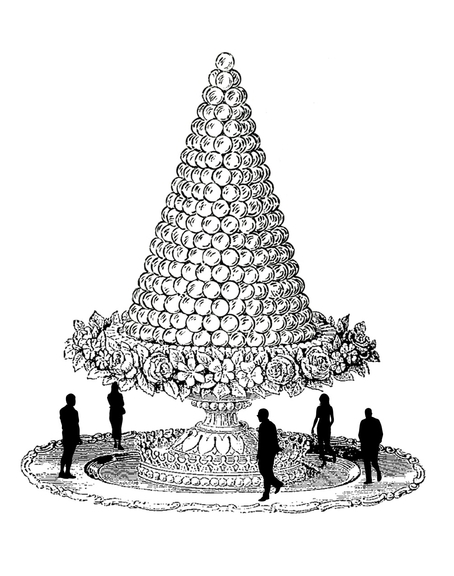 The event follow a day-long installation by Savinien Carcostea, which included an 9-foot tall cone of Croquembouches, a traditional French dessert, that was on display at Storefront’s gallery throughout the day and was offered to visitors from 6-7pm. The conversation raised the points of contact between food and architecture: From the social and political connotations of what, how, and where we eat, to the similarities and differences of the research and distribution processes, to the performativity of the act of eating as a way of producing bubbles of negotiation. The conversation include contribuitions by Jan Aman, Levan Asabashvili, Edward Eigen, and Yehuda Safran, among others. 7,000 Croquembouches were available for consumption. According to City Harvest, 1.5 million New Yorkers are struggling against hunger. A new restaurant of refined decadence is always opening around the corner. Savinien Caracostea has degrees in Architecture from the Harvard Graduate School of Design and Cornell University, a degree in Pastry Arts from the French Culinary Institute, and has extensive experience in film, photography, and graphic design. With an interest in cross-disciplinary spaces, events and publications, he consults and offers creative direction in Edible, Cinematic Architecture. For more, please visit www.savinien.com.